We had Barbara, and her husband Alan over for dinner Saturday night, and I presented her with my January TIF challenge. She was thrilled with it, and the funny thing was, which you really cannot see in this picture, the colors of her T-shirt matched the challenge! Maggie Walker . This I started some years ago. This is the bottom section of the quilt below. This is the whole quilt. 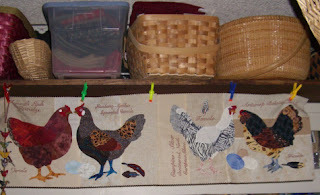 I have all the roosters and chickens done except the center big guy and the top berry portion. I had put it away and not worked on it for awhile, and took the berry section out to work on it, from which I had all my pieces traced and placement on the background, and the markings had disappeared. So I need to do that over again, got discouraged and put it back in the container. I do need to finish this. I have too much work invested in it already to just leave it. Those berries are itsy-bitsy, teeny-tiny! 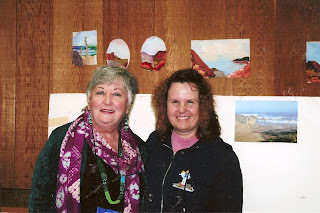 I recently joined CQI, (Crazy Quilting International), and am joining in the N2G (New to Group) swap. I finished piecing my block today. It is going to be a garden block. I don't know how it got so dark, these are not colors I normally use. It just seemed to have a mind of its own. and 4 pieces of beautiful fabric. The little primitive cat card was so cute. I think when my granddaughter Kyleigh sees this she will want to paint it! Thank you so much Lea, you really made my day! I have seen several bloggers post pictures of their sewing room. I am sort of embarrassed by mine right now. This picture faces the closet where I have a bunch of drawers of fabric, a shirt to be ironed, an open container with my CQ fabrics. Right now there is no reason to put this away as I need to piece together 2 more CQ projects. 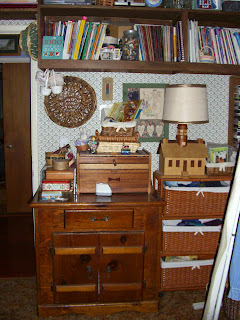 This shows where I keep a fraction of my books, threads, and all the bottom drawers have CQ trims, laces and projects. My cutting board is a mess. I have to clean it up to cut anything. This shows the cabinet my DH made me that I painted, with 2 drawers at the bottom, one where I keep my nautical fabric, the other where I keep my wools. The cabinet is stuffed with fabric, I could not put 1 more piece in there. It is 26 inches deep too, and the entire thing is full. DH built bookshelves that go up to the ceiling. He also built this dry sink that is filled with homespuns and built the lighthouse lamp. The wicker drawers are filled with batiks. This is my sewing area, and underneath I have 4 bins filled with red, white and blue, and 5 huge drawers filled with reproduction fabric. By the way, I collect baskets too! Last but not least, this is my CQ and hand sewing area off the kitchen and dining room. I use this chair when I don't feel like watching wrestling shows with DH or "action movies", and I have my little TV with built in DVD that I can watch my "chick flicks" on. Told you it was a mess! As mentioned before, I am in an ongoing RR with a group of friends: Susan, Fran, Moira and Gail. This is Gail's block. I spent 4 evenings this week doing the spray of cast on pink flowers on the bottom left hand side of the block. I love how they turn out, but they are time-consuming. After I finished work today, I spent the rest of the afternoon stitching on my Take it Further Challenge. This month, I decided to do both the concept (someone I admire), my friend Barbara and her gardening abilities, and the color scheme, as these also happen to be Barbara's favorite colors. I think Barbara will like it. Last year I was in a CQ RR with a small group of my friends. I decided to make a fairy block for my daughter Kristen. This block went around twice, as there were 4, and then 5 of us. I got the block back several weeks ago and have been working on the finishing touches. I particularly wanted to finish it for Kristen's 30th birthday on January 21, 2008. I finished it today, and am really pleased with how it came out. Thank you Susan, Moira, Gail and Fran, it looks fantastic! This was the label I put on the back of the framed piece. 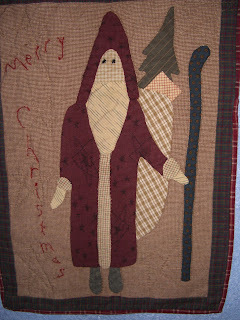 I finished my little Father Christmas for the Winter Quilt Swap and got it in the mail today. I hope my recipient likes it. I had a lot of fun working on it, and now am ready to do one of my own, maybe a bit bigger. 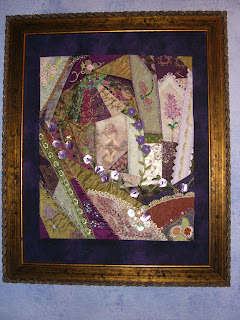 I came across Quilter's Blessings block of the month hosted by Bea at Capricorn Quilts. The blocks are embroidery and January is up. They are free and easy to download. I am going to slip this project into my things to do list, as I love the first block. This afternoon I am going to work on finishing up a CQ surprise for daughter Kristen's 30th birthday. I was in a RR with some friends, and sent this around 2 rounds. Not much to do on it, and hope to have it finished by this Friday. Hope to post a picture later in the week after I finish. I have a lot of works in progress going on right now. This is a pretty old one. I made these vest fronts probably 6 or 7 years ago. I taught a crazy quilting vest class, and I had this as a sample of how to start, along with a finished vest. Well after the class, this is as far as this project got. I am in an ongoing RR with a group of friends: Susan, Candi, Moira and Gail. This time, instead of making a new block, I decided to ask my friends to help embellish my vest fronts. Then when I get it back, I can finish it up once and for all. I have a tendency of keep putting this away and working on things for family and friends instead. My second work in progress is my Take It Further Challenge project. This is going to be a small picture I plan to give my gardening friend Barbara of "Barbara's flower garden". I hand-painted the background and pieced a foreground to put silk ribbon flowers on. This was my progress this week, hampered by my pinkie cut but hope to get working on this more this weekend. On the Winter Quilt Swap WIP, I finished hand quilting this this week, got the binding sewn on and just need to sew it down and make a label. I will post pictures after the binding is done. and do stitches in the ocean. This was at the end of the class. My hair looks pretty ragged from my morning's walk near the ocean. In December, I was the proud winner of one of Karen South's fabric and lace packages, and I wanted to show what I received. She drew 3 names after she hit 30,000 visitors on her blog. I have purchased Karen's packages before, and she always has the loveliest fabric and lace, and button packages. I was the proud recipient of being her not-secret sister years ago. And I was equally thrilled this time. These came last week, and I just wanted to show my winnings. As far as the Take It Further Challenge, I was working on it yesterday, and hopefully be able to post progress on it tomorrow. I had taken a break for dinner last night, John had brought home some fish and chips from our favorite place. I enjoyed my dinner, and then as it was going to be trash day today, took the trash out. The bag from the kitchen was sticking up so the lid would not close and I went to push it down, and cut the last section of my right pinkie, in the last fold. I think it must have been one of those lids from all those cans I opened to make chili a couple of days ago. We got it to stop bleeding, but I spent all evening with a bandage on my finger, and didn't get anything else done. But am able to type this morning with a Band Aid so hopefully after lunch will be able to get going on my projects again. I've been tagged by Candi for the You Make My Day Award. Thank you Candi! I awaited eagerly Sharon B's announcement of the concept and color choice for the Take It Further Challenge. Sharon's theme for January is "the feeling of admiration for another". At first this made me a little anxious, because I wondered how I was going to come up with something for that concept, and thought I would just do something with the color choices. But the more I looked at the color choices, it suddenly dawned on me that those colors were the favorites of my friend Barbara. And Barbara is someone I really admire in her gardening skills. Barbara is retired, so she has the time I don't have, to constantly be working in her garden, and she always has the most amazing gardens. When she lived in Sacramento, she was really close to the American River, and her soil was amazingly rich, as was her garden. A number of years ago, she moved to a retirement community in Rocklin, CA, and Rocklin I think was named for its soil composition. Barbara had a new challenge, the type of soil composition I have to contend with in my area. But Barbara began growing things in containers, and she still has an amazing garden, and she gives me samples when her garden overgrows! So my January TIF challenge will be making a garden block, dedicated to Barbara, using the color scheme Sharon gave us, as these are Barbara's favorite colors. I think I will frame this when I finish and give it to my friend Barbara. On the Winter Quilt Swap front, I have it probably 50% quilted. Hope to get some more done on this today, but not sure at this point. October, but I had used up all my dental insurance for the year, so they put a temporary on, and I have had this temporary on since October. Well due to it being the new year, I have my allotment for dental available again, so today is the first step in getting this dumb tooth fixed.